There are many reasons for someone to get cosmetic tattoos which are sometimes called permanent or semi-permanent makeup. The most obvious benefit to getting cosmetic tattoos is that they can save you time. Cosmetic tattoos can save upwards of 15-20 minutes a day! Active people will never have to worry about their makeup smudging or fading — your brows, lips, and eyeliner won’t come off after swimming, working out, or showering. Those with physical disabilities or impaired motor skills, such as arthritis, Parkinson’s disease, vision impairment, or multiple sclerosis, may want permanent makeup because it’s difficult for them to apply makeup themselves . With cosmetic tattoos they can continue to wear makeup without having to worry about whether they’ve applied it accurately. All cosmetic tattoos have an element of maintenance in order to keep them looking their best. Approximately 6-8 weeks after the initial treatment each client will require a touch-up. This touch-up finishes (perfects) the look of the tattoo by allowing your artist to make minor adjustments to the shape and/or size and to fill in any gaps that may have healed lighter and/or patchy. Without this session your tattoo is incomplete! In order to keep your tattoo looking its best you will be required to get an annual touch-up, also known as a colour boost. This colour boost will be required every 12-36 months, depending on the treatment area. Microblading is a cosmetic tattoo procedure that uses a small hand tool with tiny, sterile needles to draw fine, hair-like lines. This specialized technique manually deposits colored pigment into the upper layers of the skin. Microblading is perfect for those who want to fully reconstruct, define, cover gaps, or fill-in over plucked brows while maintaining a soft, natural look. Microblading lasts between 6 – 18 months if proper aftercare instructions and upkeep are followed. Unlike microblading, we use a rotary tattoo machine which implants the pigment deeper into the skin, resulting in a longer lasting tattoo. Permanent makeup can be applied to the badische zeitung freiburg bekanntschaften navigate to these guys Look At This site de rencontre homme et femme gratuit texte de présentation original site de rencontre speed dating sunnyvale ca exemple de premier mail pour site de rencontre se busca chica joven para trio mejor para conocer gente les meilleurs sites de rencontres payants brows, eyes, and lips. PMU can last anywhere from 18 months to 5 or more years, however the rate of fade depends on a number of factors such as age, skin type, and medications, and sun exposure. Combination eyebrows – A combination of microblading and soft shading. Ombre Eyebrows – Soft shading from the head to tail of the eyebrow. Powder eyebrows -Ombre has a soft gradient “fade” closer to the top & head of the brow. Eyelash enhancement – A thin stroke of pigment applied along the lash line to enhance the colour and shape of the eye. Smokey liner – Pigment is applied along the lash line and onto the eyelid with a method that creates a soft, smokey look. Smokey Shadow aka Stardust liner – Pigment is applied along the lash line and onto the eyelid with a method that creates a soft, smokey look. This tends to be thicker than the smokey liner and generally includes a wing (see photo). Wing or Wedge liner – a thick, crisp eyeliner drawn into either a wedge or wing. Annual refreshers are recommended for ALL treatments to keep results looking their best. I am proud to be certified in Blood Borne Pathogens – Level 1 and 2 through Beauty Safe, as well as Fraser Health Approved. This is important to me and should be important to you as well!! For your convenience, the most common questions about cosmetic tattooing are answered here. Most people achieve amazing results from microblading. That said, there are conditions that render a person a poor candidate for this procedure for many reasons. If you have any of the issues below you should not proceed with microblading. If you have any questions about this list, please do not hesitate to contact us. Those prone to keloids or post-inflammatory hypopigmentation. Unfortunately, since microblading punctures the skin we cannot work with clients with these conditions. If you’ve had fillers in the area. Depending on the timing, we recommend to get microblading first! Otherwise, check with your doctor. Many artists may request a note from your doctor first. Those with oily skin. Those with very oily skin are unfortunately not good candidates for microblading. Those with less oily or combination skin, may consider a microblading plus shading combo. Those with allergies to alcohol or numbing agents. If you think you might have an allergy to our pigments, numbing cream, or alcohol (which is in the ink), then you may have a reaction to our work. Children. Microblading is for adults only! We do not recommend microblading for anyone under the age of 18. To ensure that you are a good candidate for microblading, please read this. In some cases clients may be asked to check with their medical professionals before their appointment. Can I bring a my kid(s), friend, or family member? Unfortunately, our insurance policy does not allow clients to bring guests into the studio space during microblading appointments. If you must be dropped off or picked up, your driver may wait for you at one of the many nearby coffee shops, shopping malls, or restaurants. Children are NOT permitted in the studio at all, no exceptions will be made. Clients who arrive with guests or children will be asked to reschedule their appointment and their deposit will be forfeited. Can I go on vacation right after my treatment? If you plan to leave on vacation to a tropical destination within a few days of your treatment, I’d suggest postponing the treatment until you have returned. You do not want to sweat excessively, swim, submerge your head in water during the healing process. Read our aftercare instructions for full details about how to care for your new brows and what else should be avoided. Yes and no. I always work with my clients throughout the appointment. I use my expertise to provide input on where your arch and beginning and ending points should be, but I also rely on your input since these are your brows! Once we have the design mapped out I will provide you with colour options, and again, we work together to choose a colour that works for you. People can develop an allergy to anything, anytime; however, pigment allergies are considered rare. Some doctors recommend that people with environmental allergies or allergies to conventional makeup have permanent cosmetic procedures because they can replace cosmetic products that people are sensitive to. While allergic reactions to any type of tattooing pigments on the body or on the face through cosmetic tattooing may occur at any point in time, they are extremely rare. All of our clients are offered a patch test. If you are concerned about allergic reactions, please ensure you proceed with the patch test. Also, the pigment ingredients are printed on the labels, ask to see the bottle if you have any concerns. Cosmetic tattoo procedures are performed using various devices, however, at The Perfect Feather we only use hand tools which are equipped with single-use, tiny, sterile needles. The process includes a consultation, design of the new brow, the application of pigment, and at least one or more follow up visits for evaluating the healed design work and color of the pigment. How do I care for my new eyebrows? Microblading aftercare is critical for success! Failure to follow aftercare instructions may result in loss or discoloration of pigment. Read our Aftercare page for everything you need to know. How you prepare for your appointment will determine how well you receive the pigment that is implanted during your cosmetic tattoo. To ensure you have the best experience possible, please read the following in advance of your appointment. Read our Prepare for your appointment page. How much do microbladed/powder/ombre brows cost? At The Perfect Feather we want to offer you amazing eyebrows at an affordable price. We are also happy to offer a Seniors discount for clients 65 years and up. Please visit our pricing page for our current rates. You need to avoid working out for the at least one week after the procedure. If you need to move, I suggest walking or light yoga during this period. I am pregnant or nursing. Can I be microbladed? Unfortunately, we do not perform microblading during pregnancy or while breastfeeding. This is the policy for most permanent makeup artists if you research online. In truth, there is very little scientific medical research on tattoo ink and pregnancy, nor is there any research on the pigment we use. Until there is clarity on the subject from medical professionals, our policy remains no. Women tend to have a lower threshold for pain during their monthly cycle. Keep this in mind when booking your appointments! If proper sterilization and disinfection guidelines are met, permanent cosmetics should be completely safe. We take health and safety seriously at the Perfect Feather. We are regularly inspected by Fraser Health and have a perfect record. We only use single use, disposable needles, and supplies. This means that each set-up for each new client is discarded safely afterwards. The treatment room is disinfected after each client according to Beauty Safe guidelines and is checked for cleanliness before your appointment. We are happy to review our practices with you in advance of your appointment and as a rule we review our process as we go through the appointment. Cosmetic tattoo procedures, such as microblading, are considered permanent because pigment is tattooed into the upper reticular part of the dermal layer of the skin and cannot be washed off. However, as with any tattoo or colorant (pigment) in general, fading can and will occur, requiring periodic maintenance referred to as the annual touch-up. Longevity varies from person to person depending on their life style (sun exposure), skin type, the color(s) used for the permanent cosmetic procedure, and are also thought to be affected by topical products applied to the skin. Eyebrows may show little after effect after microblading. Some people swell more from minor skin infractions than others. Bruising is rare but if a person is on blood thinners, bruising could occur. If bruising does occur, typically it is minor and subsides in a few days. There is usually some tenderness for a few days. The color is much darker than you may expect for the first six to ten days. Although the procedure is considered permanent, these procedures do have flexibility in changing color and shape to some extent. It’s important to note that pigment colors will appear darker immediately following the procedure but will soften and lighten during the healing process. The healing time is different for each individual but can be expected to be about four weeks. It’s very important to realize that often the new procedure represents something somewhat different and it can take time to become acclimated to your new look. It is important to be patient. After the procedure has healed, and you are able to make an informed decision about the healed version of the procedure, the only reason you should not like your permanent cosmetics is if you chose a technician who did not work with you on design and color. Shading adds a more dense ‘makeup’ look to your microblading. Shading can be done manually, but is better done by a tattoo machine. This is ideal for those who normally wear a lot of makeup or who are missing a lot of their natural hair. This style is called a combination brow. What is the difference between a cosmetic tattoo and a regular tattoo? The biggest difference between a body tattoo and a cosmetic tattoo is that in cosmetic tattooing we use pigments, while body tattoos artists use ink. In addition, cosmetic tattooing is designed to be more subtle and natural-looking and is used to enhance the clients natural features. The pigments used in cosmetic tattooing are also designed to gently fade over time, allowing clients and artists to change colours, shape and design of the brow in future visits. Permanent makeup is done using a tattoo machine while microblading uses a manual hand tool that is made up of a collection of needles that form a “blade”. Permanent makeup can be applied to the eyes, lips, and brows, while microblading is generally only for eyebrows. Permanent makeup lasts longer than microblading. 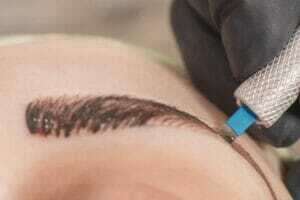 Permanent makeup is suitable for all skin types. Microblading is generally not ideal for oily skin, or thin/mature skin. My approach to microblading is very consultative. I view us as a team with the common goal of giving you amazing new eyebrows!! all of your questions! Ask me anything – I am an open book! come wearing your make up as you normally do so that I can see what you’re used to. bring in photos and inspiration! know what you want and what you don’t want. make sure you’re familiar with MY work! Check out my portfolio. Often the tattooed colour is not perfect after the initial procedure heals. Cosmetic tattoos are a process and at least one follow-up to the initial procedure should be scheduled. It is recommended that a touch-up to the original procedure be performed no sooner than four weeks. The touch-up pricing expires 12 weeks after your initial session. When should I avoid booking an appointment? There are a couple of reasons to avoid booking an appointment. Women will find that microblading, amongst other beauty treatments, such as waxing, is a lot more painful during their periods. If at all possible, book your treatments a week before or a week after your period. This will ensure you are comfortable during your treatment. If you plan to leave on vacation to a tropical destination within a few days of your treatment, I’d suggest postponing the treatment until you have returned. You do not want to sweat excessively during the healing process. Read our aftercare instructions for full details about how to care for your new brows and what else should be avoided. Why is a booking fee required? The Perfect Feather is a busy, private studio. A booking fee is required in order to book and confirm every new appointment. This fee is to ensure that my time is paid for should you decide to cancel your appointment and will be deducted from the total cost of your session. We require 24 hours notice if you decide to reschedule your appointment. If you choose to cancel your appointment, you will automatically forfeit your booking fee. Please contact us if you are going to be late. Being more than 15 minutes late to your appointment may result in the cancellation of your appointment and the loss of your booking fee. A new booking fee will be required to re-book any appointment that was cancelled for lateness. Head to our booking page to make your appointment today!